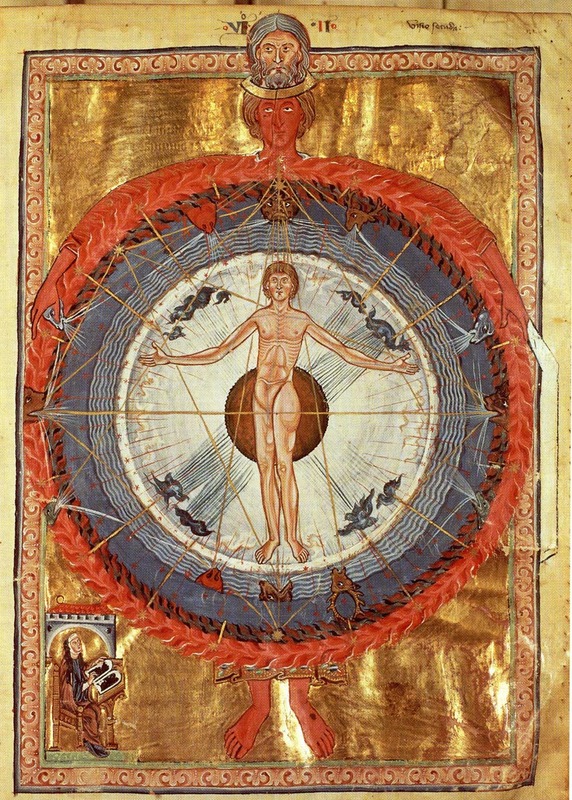 After describing each successive circular layer of the cosmos, Hildegard sees that, “there stretched a line, as it were, from the beginning of the eastern part of that wheel to the end of its western part, and it faced the northern part, separating as it were the northern region from the other regions.” But, as Peter Dronke notes, the only line in the Lucca miniature that could correspond to this is the bright red line marked horizontally across image, stretching from the bear’s head, which Hildegard places in the north (left side of the image), to the lion’s head in the south (right side of the image). In all other respects, the image follows medieval convention in orienting the East at the top of the page, where the leopard’s head appears. 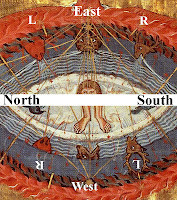 If the line from east to west can be identified with the line associated with the arc of the sun later in the vision, then the correct depiction would have a line beginning above the human image’s head (the east), arc to the viewer’s right past the image’s left side to the south, and then come back to the center to end below the image’s feet in the west. Furthermore, to the left of this image, in the space of the black fire, there appeared, as it were, the head of a bear. It gave from its mouth a breath that, extending a little way to the left and to the right of that mouth, issued on the right in the head of a lamb and received on the left the form of the head of a serpent. And from the mouth of this lamb’s head, as it were, another breath extended itself to the middle space that was between the heads of the bear and leopard; while from the mouth of this serpent’s head, as it were, another breath proceeded by stretching itself forth to the middle space that was between the heads of the bear and wolf. (…) All of these heads also gave their breath into the abovementioned wheel and onto the aforesaid human image. With reference to those later commentary chapters, it soon becomes clear that the perspective determining left and right must be dynamic, rather than static—that is, the orientation changes in the course of the vision text. 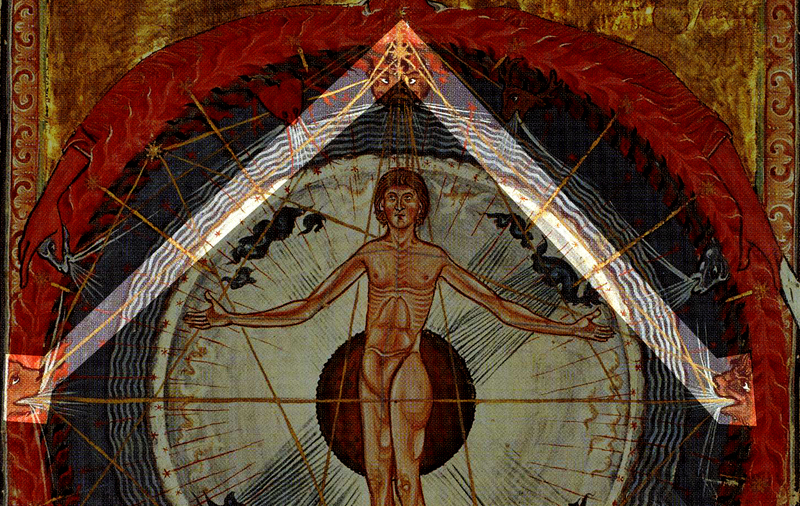 In placing the four principal heads, “to the right of this image” (ad dextram imaginis ipsius) and “to the left of this image” (ad sinistram uero eiusdem imaginis ) must mean, not the right and left sides from the perspective of the human image, but left and right of the entire visionary field, from the perspective of a viewer facing the image, parallel to the manuscript page on which the illustration appears. 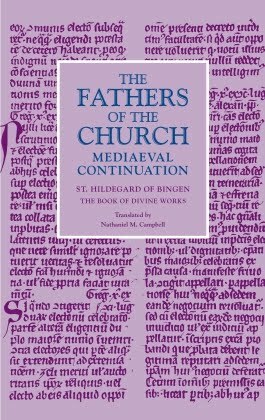 Yet, when describing the collateral winds subordinate to each principal head, Hildegard appears to shift perspective by placing herself in the middle of this vision’s great complex of circles, perpendicular to the plane of the manuscript page. She then turns to face each part of the image as she describes it, thus making the orientation of left and right shift with each new image. As a result, the Lucca miniaturest has erred in the placement of the crabs’ and stags’ heads flanking the leopard’s head (east) and wolf’s head (west), which appear above the human image’s head and below its feet, respectively. Above, the crab’s head should appear to the right (south) of the leopard and the stag’s head to the left (north); while below, after turning the page around to reorient ourselves facing the wolf’s head, the stag’s head will be on the right (north) and the crab’s on the left (south). Thus, a proper illustration, with the leopard (east) oriented to the top of the page, would have the stags’ heads appearing on the (viewer’s) left of both the leopard and the wolf, with the crabs’ heads on the (viewer’s) right—the opposite of the Lucca illustration’s arrangement. 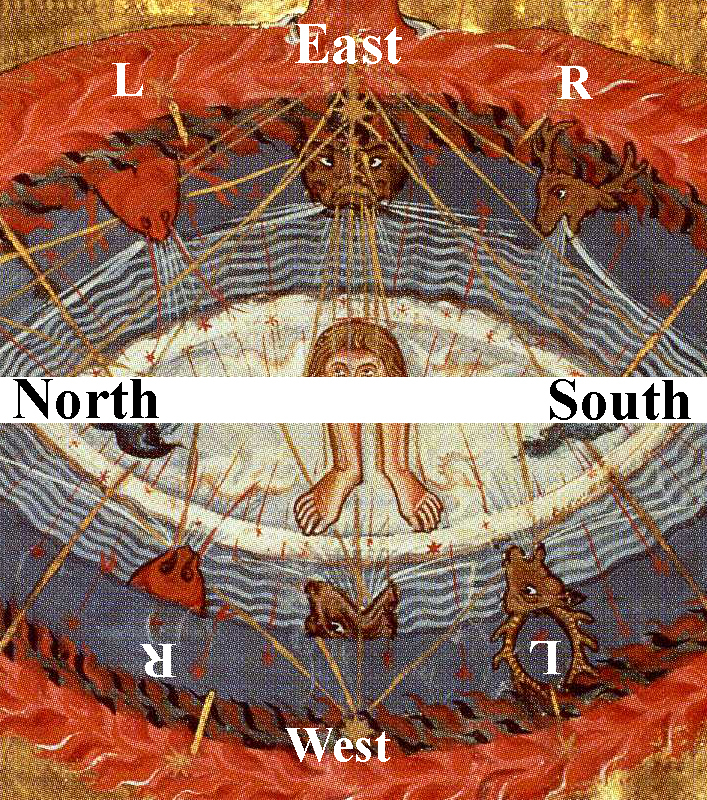 The miniature does, however, correctly orient the heads of the lambs above (east) and serpents below (west) the heads of the bear (north) and lion (south). of the Lucca manuscript appears to have erred here, however, as the illustration includes a ray going from the sun’s large star (in the darker “black” fire directly above the leopard’s head) to both the bear’s head (in the north, to the viewer’s left) and the lion’s head (in the south, to the viewer’s right). For all of these errors, however, the miniature is remarkably accurate in most other details, especially the scale of each element in relation to the others. Based on the ratios given in the vision text, the diameter of the central globe is one-fifth the diameter of the total instrument, thus making the illustration accurate in its scale. With the globe in the center, the next fifth on either side corresponds to the thin air full of clouds, while the final fifth on either side can be subdivided into three sections of equal width: the combined circles of strong, bright white air and watery air; the circle of ether; and the combined circles of black and bright fire. As I continue to grapple with this intricate and complex vision, I will continue to check the details of the Lucca image against it, to see if there are other discrepancies; and I hope that my readers will chime in if they find any that I have missed. I will also continue to think upon their import, for, as I have suggested elsewhere in regards to the images in the Rupertsberg Scivias manuscript, it is possible that differences between visual image and textual record are complementary, rather than discordant.